At a recent 2014 geneva motor show Audi unveiled its first ever S Cabriolet in compact class segment. We are here talking about the more powerful and sportive Audi S3 Cabriolet 2015. The opentop model features seating for four-people and is adorned with stunning looks and powerful engine beneath its hood. Let us have a look at the review of Audi S3 Cabriolet 2015 to know more about it. Interior of Audi S3 Cabriolet 2015 is elegant with looks and is made from superior quality materials. Entering inside the S3 Cabriolet 2015 you’ll notice the sports seats that come with S3 logos embossed on them while the seat surfaces can be pulled out. Sitting over these ultra-comfortable seats you’ll have a multifunction sports steering wheel that comes wrapped in leather and assures firm grip and control over the car. Behind the wheel you’ll notice shift paddles (optional) and the gorgeous instrument cluster with S-specific dark gray metallic and digits and needles in white. Apart from these to enlighten the interior of Audi S3 Cabriolet 2015 you have MMI navigation plus with MMI touch and a high-resolution seven-inch monitor marking its presence at the center of dash. Last but definitely not the least rear seat (if in case not needed) can be folded and thus you can have lot of extra space for your luggage. The exterior of Audi S3 Cabriolet 2015 looks luxurious and sportive. It starts capturing and ruling you with its soft top that is made from magnesium, aluminum and high strength steel. The materials so used keep its weight low without compromising with its durability. Thus the top can be functioned even at the speed of 31 mph. Moving towards the front fascia you have a singleframe grille which comes surrounded by chrome frame featuring platinum gray insert and cross struts with aluminum look. At both the side of grille are sleek LED headlights that add to the aggressive looks. Beneath this setup there are air intakes that are framed with powerful edges. Marching further towards the rear end of the model you’ll notice aluminum strips on windshield frame and beltline. Rear-view mirrors are housed in compartment that features aluminum look. While the luggage compartment lid complements the overall looks with spoiler edge over the redesigned bumper, the LED taillights at both the ends add commendably. In all the exterior of Audi S3 Cabriolet 2015 has that everything which you need to steal the gleam over streets. 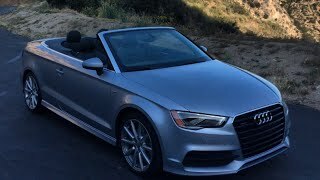 The Audi S3 Cabriolet 2015 get its power through a 2.0 Liter TFSI engine generating total output of 300 hp and peak torque of 380 nm mating to six-speed S tronic transmission. With this power rolling its 18-inch wheels, top speed of Audi S3 Cabriolet 2015 can reach the mark of 155 mph while 0-62 mph sprint can be knocked in 5.4 seconds.